Inspiring all, young and old! Carol is 85 years young. She has been personal training with Vicki Kehoe for 15 years. Her daughter, Cathy Hill, originally referred her to Vicki. Cathy and her husband also work out with Vicki and thought it would be a great fit for her mom. Carol has been training with Vicki ever since. "As you age your equilibrium becomes increasingly unsteady, so training with Vicki has helped me become more balanced and steady which helps me with everyday activities." At first, Carol found the fitness floor and all its equipment intimidating. She has now learned how to use the equipment and understands the proper functions of the different machines with Vicki’s guidance. "Vicki is very knowledgeable, encouraging and understanding. She is able to modify exercises so they are done in a safe but also effective manner." Carol always strives to get the maximum benefits from her workouts. She believes that if you are being physically active you in turn do better mentally. 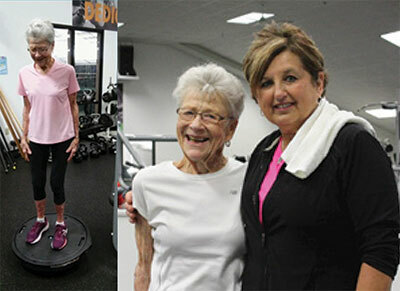 Not only does Carol workout with Vicki twice a week, but she also does 20-25 minute of exercises on her own every day. When Carol is not in the gym with Vicki, she enjoys socializing with friends and family, and anything active!